The VOC Concentrator, or FBC, is an activated carbon adsorption system designed to capture and destroy volatile organic compounds (VOCs) and hazardous air pollutants (HAPs) from industrial process exhausts. 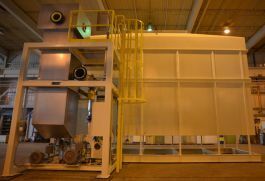 An FBC system consists of three main pieces of equipment: the Adsorber, where the VOCs are captured; the Desorber, where the VOCs are heated and released; and the Thermal Oxidizer, where the VOCs are destroyed. The Adsorber and Desorber skid are show at right or below. Adsorption: Exhaust air from manufacturing or industrial processes carrying VOCs & HAPs is propelled through trays containing small carbon beads; the pollutants and emissions are captured (adsorbed) by the activated carbon beads. Desorption: The VOC-laden "spent" carbon is pneumatically transferred to the Desorption Tower where it is heated to ~400$deg;F and the VOCs are released into a small volume air stream. Thermal Oxidizer: The small volume air stream with concentrated VOCs is sent to a thermal oxidizer where the concentrated VOCs are decomposed at temperatures of ~1450°F. 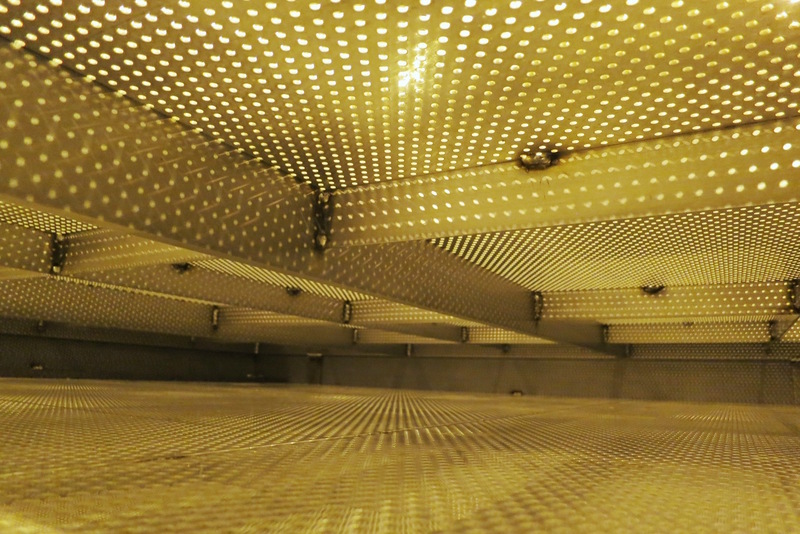 A heat exchanger is used to recovery waste heat from the thermal oxidizer and heat the fresh air coming in to the desorber. 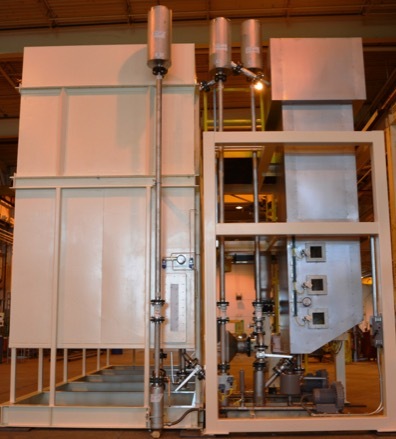 An optional heat exchanger can be used to use the incinerator's waste heat to warm the air coming into the oxidizer, making the incinerator into a thermal recuperative oxidizer. 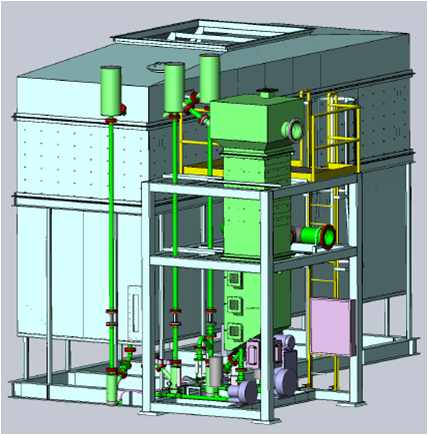 The key feature of the FBC technology is a smaller thermal oxidizer, saving energy costs. Every FBC comes with 304-SS trays in the Adsorber and Desorber to hold the BAC. The key ingredient, a specially-designed, synthetic carbon bead manufactured by Kureha in Japan specifically for use in FBC systems worldwide. The FBC system is considerably lighter and smaller than competing carbon rotors and RTOs. Compared to an RTO or Rotor, the FBC system reduces the number of moving parts so there's fewer things to break. Up to 80% reduction in natural gas usage, when comapred to an RTO, and up to 65% reduction in electricity, depending on inlet conditions. 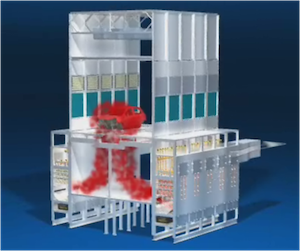 Up to 80% reduction in CO2 emissions from the thermal oxidizer / incinerator burner. An ultra-low NOX burner controller is available also. An FBC system needs a smaller thermal oxidizer than a traditional RTO, Regenerative Catalytic Oxidizer (RCO), or Rotor Concentrator. A smaller thermal oxidizer costs less, reducing the required capital investment and saving you money upfront. No shutting down production due to a faulty RTO valve or broken rotor wheel. Fewer moving parts means more up time. With FBC, maintenance is simple and easy. Change out carbon once per year and annual burner calibrations are all that's needed. The pressure drop through an FBC system is less than an RTO or Rotor, so the fan motor is smalled and more likely to be available in a typical spare part inventory. 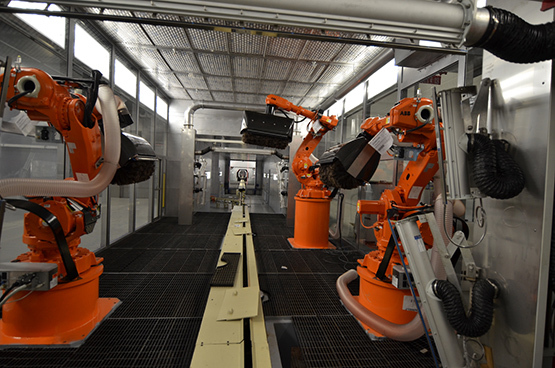 FBC systems are used in the paint, coatings, semiconductor, electronics, materials, food processing, furniture, printing, and solvent recovery industries. 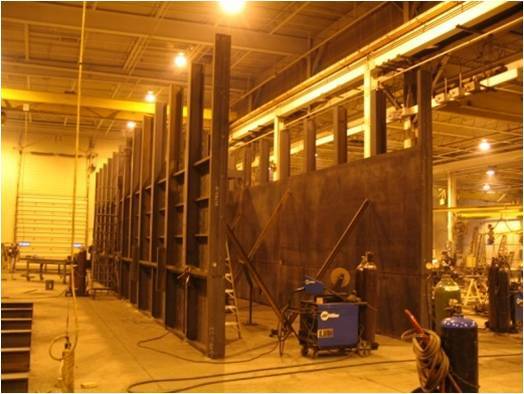 FBC carbon concentrator systems have been installed to treat exhaust volumes from 10,000 cfm (16,990 m3/hr) to 100,000+ cfm (169,900 m3/hr). FBC can treat any larger volume of air using a combination of multiple Adsorber units. FBC units are ideal for VOC concentrations in the 50-200 ppm (as solvent) range. For a 40,000 cfm system, this equates to ~10 lbs/hr to ~50 lbs/hr of VOC emissions. Our VOC Concentrator system works best for industrial exhausts containing airborne & gaseous organic solvents, VOCs, HAPs, and other volatile organics. Inorganic waste gases such as H2S, ammonia, and acid gases are a better fit for a gas scrubber. FBC doesn't work with exhaust temps above 120°F, exhausts containing alcohols with low boiling points or long-chain organics with high boiling points. Customers should also avoid non-volatiles and compounds prone to polymerization or joining reactions with other exhaust chemicals. If the inlet humidity is too high, the water vapor molecules will occupy the carbon pore sites that are meant for VOCs, and the capture efficiency for VOCs will decrease. If the inlet temperature for adsorption is above 100°F, then the VOC molecules have too much kinetic energy and they are less likely to adsorb onto the activated carbon beads. Keeping the inlet adsorb temps below 100°F ensures a DRE above 95%. The activated carbon beads require multi-stage filtration to 99% of greater particle removal. Typically a series of 3 filter banks are used to achieve the required filtration. Solvent & VOC destruction and removal efficiencies of 95% or high are possible, depending on the combination of solvent types and their inlet concentrations. Unlike a traditional rotor concentrator that is limited to a 20:1 concentration ratio, the FBC system and achieve concentration ratios in the hundreds if air is used as the desorption flow gas or the thousands if pure nitrogen is used as the desorption flow gas. 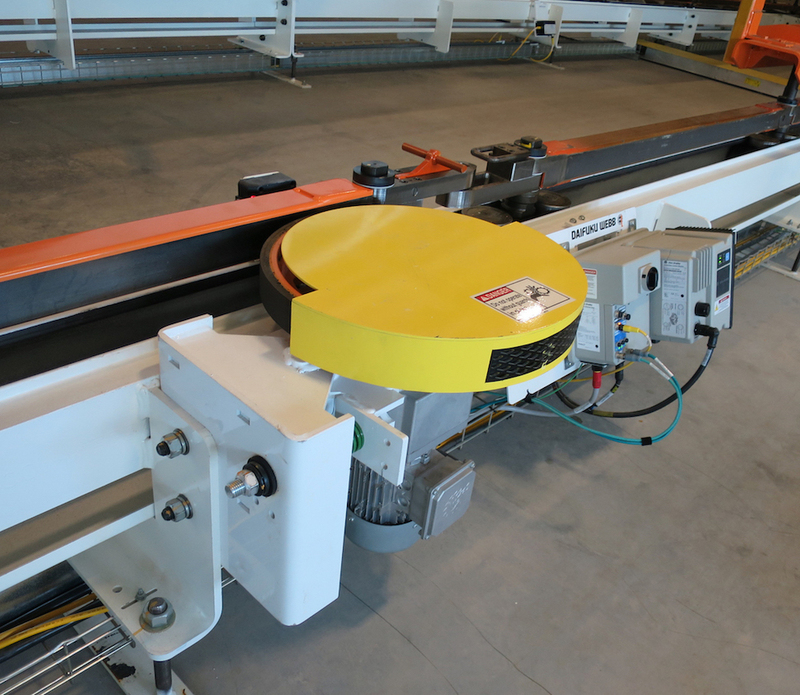 When replacing a large RTO system, an FBC system can offer a reduction in energy usage up to 90%, depending on the size of the equipment. Honda Alabama successfully achieved an 80% reduction in energy usage when switching from a 100,000 cfm RTO system to a 100,000 cfm dual-Adsorber FBC system at their Lincoln, AL plant. How often does the beaded activated carbon (BAC) need to be reactivated? Most batches of carbon last about one year, but it does vary some based on the solvent loading, total run time, and type of solvents, particularly the percentage high boiling point solvents. What are the footprint and floor loading requirements for FBC? Smaller FBC systems can fit in a 25' x 25' area, but medium-to-large FBCs require a 30' x 30' area. Where else has the FBC system been installed? The FBC system has been installed over 10 times since introduction at four different Fortune 500 companies. Let TKS handle every aspect of your project from start-to-finish. TKS offers monthly, quarterly, and yearly FBC health check assessments to evaluate performance, carbon life, and perform critical preventative maintenance tasks. Let the FBC experts handle the maintenance for you. 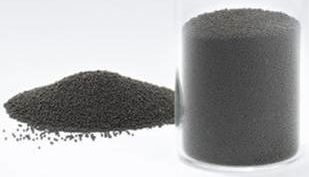 Ready to reactivate your beaded activated carbon or need to purchase new carbon? We're here to help with quick turnaround times. Having a problem with your FBC? Our FBC experts and engineers are always available to help. Need an FBC expert to come to your plant location to help for the day? No problem. Our engineers are available to help out for a minimal daily fee. If you need help, advice, or expertise, the TKS Engineering team is always available to assist our FBC customers.